A few weeks ago when I started my journey into the Android world, I was not sure if I could take the leap, but boy oh boy have I been converted! Ahead of the launch, I got to attend an exclusive Lifestyle Media Preview event where we got insights from Global Senior Product Marketing Manager Peter Gauden and a small masterclass from Leica photographer Alex Lambrechts. We also got to see a display of photos taken by the amazing Helena Christensen. Since Mobile World Congress the world wondered, will Huawei deliver at the launch or will they fall short?. It was pretty obvious that they didn’t just deliver, they wowed each and every person in the audience. One of the biggest impacts for me, was the way Richard Yu delivered the presentation. Having attended launches before, you see a basic presentation, a new product and then you get to see the product demo. But this time it was different. First of all, all the extra features, it was not just 1 or 2 or 3, it looked like a Mary Poppins bag! The features kept on coming! And you could see how much fun Richard Yu was having on stage, you could feel how proud he was of these new devices and how they were miles away from their competitors when it came to the Master AI and the photo quality. Richard Yu even commented on the question many people have asked him… Why P20 and not P11 or P12?, and his answer was quite simple. They are so far ahead that they also jumped on the numbers! Calling it P11 would have not been enough. This is the best looking and best built phone Huawei has made to date. Talk about boldness and confidence! I have to say that although spokesperson Gal Gadot was around, not even the beautiful actress could take away the focus from these beautiful devices and where the main stream media’s focus was on. So how about we start with the official video presentation? As per Huawei’s press release, both devices include unprecedented AI advances, combining technology and art to bring to life a groundbreaking smartphone experience. With the debut of the Huawei P20 Series, Huawei makes capturing professional quality images a truly effortless experience for everyone. We cannot forget the first ever front facing 24MP camera for all the selfie lovers. It has never been easier to take high end photos, and print ready quality from a smartphone. You get vibrant, sharp and dazzling images. A highlight during the launch was the presentation by Richard Yu and Dr Jan Becker, CEO of Porsche Design when they announced the collaboration for the Porsche Design Huawei Mate RS smartphone which combines Porsche Design’s signature brand aesthetic with Huawei’s mobile engineering expertise setting a new standard in luxury smartphones. “The Porsche Design Huawei Mate RS (Race Sport) features a Leica triple camera with the highest total pixel count on a smartphone available in the market – the camera configuration is comprised of a 40MP RGB sensor, a 20MP monochrome sensor and an 8MP sensor with telephoto lens. This is the world’s first smartphone equipped with microcapsule PCM – an aerospace cooling technology for maintaining a safe temperature. In addition, the Porsche Design Huawei Mate RS features an innovative in-screen fingerprint sensor which allows consumers to wake up the device by floating their finger above the display, while touching the sensor to unlock the device is lightning fast. The back fingerprint sensor can also be used to unlock the device or to access a second, secure space. The 6-inch OLED 2K curved screen Porsche Design Huawei Mate RS is available in Black, and for the first time, in an eye-catching Red. An advanced camera system to capture more light, more details and more beauty, featuring a revolutionary Leica triple camera and 5x Hybrid Zoom on the Huawei P20 Pro, and a Leica dual camera on the Huawei P20;The 5x Hybrid Zoom allows you to zoom in on your subject and produce outstanding results when you want to capture incredible details at a distance. Innovative photography features, including Master AI with AI-driven professional photography and Huawei AIS (AI Image Stabilization), a powerful AI stabilization technology; The AIS allows you to capture amazing handheld shots in low-light using Night Mode. Nigh mode balances high-contrast scenes for amazing snaps. See below for a photo taken on the plane ride back from Paris to London, if you pay attention you can even see the lit up London Eye! The P20 Pro is able to recognize more than 500 scenarios in 19 categories so when taking a photo, professional photography skills like lighting and other settings are then automatically adjusted by AI so your photo is the best it can be. The Huawei P20 Pro is also able to recognize the scene you’re framing, and cloud balance your photo automatically. The slo mo feature under video, with the click of a button you can create professional quality slow motion videos, something that before you would have to pay someone to do for you or you needed to be a pro to do it. It records 960 frames per second. 4D predictive focus that result in sharp, clear action shots and blur free photographs. The Ultra Snapshot! Double press the volume down button to capture any moment, eve from a locked screen, in as fast as 0.3 seconds. Let’s talk about the battery life for a second since Huawei is starting to be known for it. I first saw it with the Mate 10 Pro, when my smartphone would simply just keep on going for up to 40 hours in a single charge (depends on usage of course). The P20 gets a 3400mAh battery and the P20 Pro gets a 4000mAh one. Can we crown Huawei as the king of batteries now? These devices. Come with a supercharger that can have your phone at a 100% charge in about an hour, another A+ for Huawei. “My fave feature on the P20 Pro is the slow-motion video. It allows you to capture things that in the past would have been very hard to record in a high quality slow-motion video. For example, I took a slow-motion video of our campfire last weekend. It captured the essence of each flame. Totally memorizing! For me it has to be the Master AI, the more I play with my P20 Pro the more it gets to know me and the more it predicts my behavior, how I text, what I say next based on previous patterns. A device that becomes more efficient the more you use it is for sure another A+ for me. Although of course the photo quality I beyond this world! If I had to pick on one thing, is that I got used to the fingerprint sensor being at the back like on the Mate 10 Pro, and maybe I would have liked to see it at the back on the P20 series too. Although this is more of a personal preference. It’s so smooth that it’s quite slippery, so I suggest getting a case as soon as possible to protect it. Here are a couple of examples of photos taken with the P20 Pro. This black and white selfie looks edited right? !… Well is not! Click of a button under the 3D Portrait lighting mode and you can choose from Classic Lighting (used for this photo), Stage, Split, Butterfly, Soft or no lighting! The Huawei P20 Pro uses its AI-driven 3D facial modelling technology to follow the contours of your features, adjusting for the most flattering selfies. Augmented Reality: The P20 Pro is an ARCore supported device. Immersive Audio Experience: The P20 Pro incorporates Dolby Atmos sound system that breaks new ground for smartphone audio. Want more? Huawei has a strong partnership with Google. You can now see 1st Wave Android 8.1 & NNAPI, Deeply customized Google Assistant, First features in Android messages with NPU acceleration and 1st Wave ARCore. 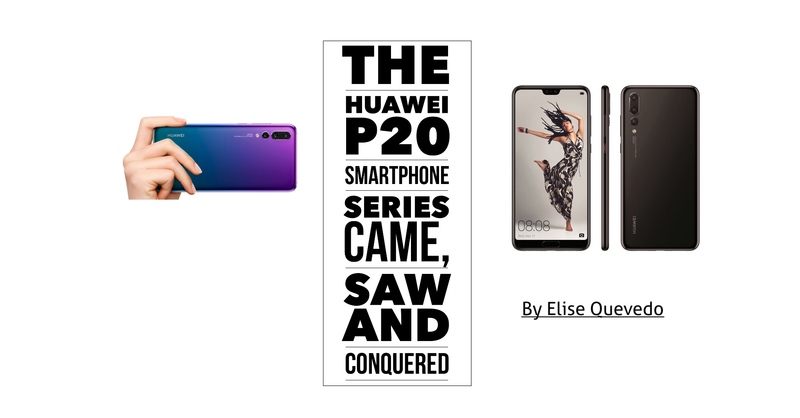 To sum all of it up, the Huawei P20 series came, saw and conquered. With a top end design and all-new,exclusive, fashionable colors like Twilight (the one I have… mesmerizing!! ), Pink Gold, Black and Midnight Blue, these smartphones are going to be at the top of the rankings for a while. The camera was hands down the star of the show. And the new “gradient” color finishes that shift in the light is very unique! No wonder I can’t stop staring at my P20 Pro. I hands down agree with Mike here, they have shaken up the market big time and the question is now, who will beat them? So what is the cost and when can I buy it? Final note, did you win me over P20 Series?… Yes you did! 1 week is not enough for me to share my full views on some of the other features, so stay tuned and I shall give an update in a few weeks once I get to know my P20 Pro a bit more!